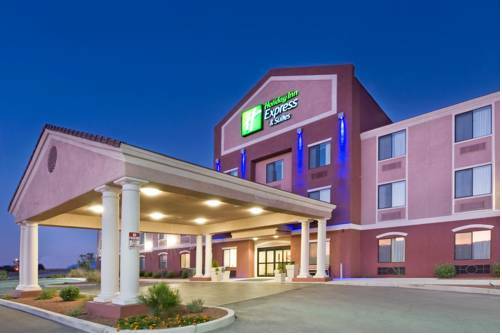 Welcome to the Holiday Inn Express Hotel & Suites in Historic Willcox, Arizona. We are conveniently located at Exit 340 of Interstate 10, 80 miles east of Tucson, 75 miles North of Mexico and 40 miles west of New Mexico. We are considered 'high desert' at an elevation of 4,167 ft. The mountains are visible from all sides of our property. Our complimentary deluxe hot breakfast features our signature Cinnamon Rolls, a selection of cereals, omelets or scrambled eggs, biscuits, and a choice of muffins and bread. We also feature our Smart Roast Coffee, a selection of juices and teas and hot chocolate. The rooms offer comfortable beds, alarm clocks, hair dryers, coffee makers, irons and ironing boards. We also have suites available that have microwaves and refrigerators. We have a beautiful outdoor heated pool, a fitness center and the business center for the use of all our guests. Our hotel offers free wired and wireless internet connections in all our rooms. We are within a short distance of a variety of restaurants, shopping and many historic sites. Our guests have described us as a 'gem in the desert'. We hope you will come visit with us often. Western themed atmosphere as restaurant is located inside rail car. Menu includes steaks, chicken, ribs, sandwiches, salads and desserts. You can get your favorite beverages including a selection of beer. Visit the museum honoring the people who created the rich heritage of the area.Collections and exhibits of historical artifacts,including a Geronimo Exhibit are part of the museum. "The Town Too Tough To Die' - visit the home of Wyatt Earp and feel what it was like to live in the 'old west'. Check out the reenactments of the famous gunfight at the O.K. Corral. Witness the dramatic events that made Tombstone famous.